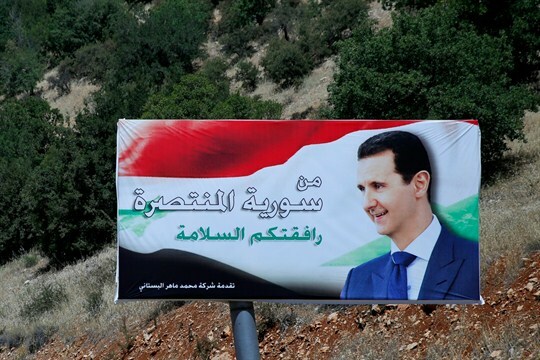 A poster of Syrian President Bashar al-Assad with Arabic that reads “Welcome to victorious Syria,” is displayed on the border between Lebanon and Syria, July 20, 2018 (AP photo by Hassan Ammar). The billboards that greet people crossing the border from neighboring Lebanon now read: “Welcome to victorious Syria.” It’s unclear if they’ve replaced the old signs inviting you into “Assad’s Syria,” which have adorned highways near Syria’s land borders and the Damascus airport for years. A decade ago, one of the many other pieces of pro-Assad propaganda lining roads and the sides of buildings across the country was a huge, backlit sign that guarded an entrance to Damascus’ Old City, abutting the medieval Citadel: “I Believe in Syria,” it read, next to a beaming, waving President Bashar al-Assad.